Never been a big fan of reptiles. They’re sort of slimy and cold-blooded, usually with fangs or big teeth. Hollywood has had a love affair with reptiles though with Jurassic Park, Godzilla and scores of nasty, scaly monsters. Starring: Megan Fox, Will Arnett, William Fichtner, Alan Ritchson, Noel Fisher, Jeremy Howard, Johnny Knoxville, and Tony Shalhoub. But it’s hard not to like the four turtles, mutated at birth, trained as ninjas and aged between 13 – 17, making them teenagers. I wish I was sitting in the conference room when they decided to name these four unlikely comic-book characters after renaissance painters – Raphael, Michelangelo, Leonardo and Donatello. Then, of course, there’s the talking rat. Stay with me… I’ll get to the plot soon. This is the fifth feature-length incarnation of the Teenage Mutant Ninja Turtles, all spawned from the unlikely, but hugely successful comic book series that kicked off in 1984. Nurmerous TV cartoon series, action figures and franchise frippery have made the TMNTs one of the greatest comic-book-to-cinema successes of all time. So they drag in Michael Bay as the Producer and Jonathan Liebesman as Director, the latter cutting his teeth on a handful of horror/scifi/fantasy films before taking on the turtles. Michael Bay has any number of visually stunning flicks under his belt – lens flare, slo-motion and explosions being his tools of trade. But maybe not even Michael Bay could turn his Transformer-talents into creating convincing ninja turtles. It all starts in a science lab. Experiment goes wrong, mutated lab animals (four baby turtles and a rat) end up in the sewer, grow into human-sized, intelligent and very powerful creatures, learn english and the art of the ninja and go about fighting the forces of evil. Luckily for us, there is no shortage of forces of evil that we need heroes – green, in leotards or wearing capes – to fight. The franchise has given our four stars a 2014 make-over with gritty, life-like textures, plenty of shiny weapons and the latest gadgets. The same teenage buffoonery keeps us amused, which is just as well because the bits joining the sparse funny lines are mostly forgettable. Michael Bay dragged along Megan Fox, who draped herself over Autobots in hot pants in the first Transformers reboot. I’m not sure what Fox has been doing since but she’s almost unrecognisable as journalist April O’Neil as she befriends the four crime-fighters. Whoopi Goldberg does a cameo, playing a character that acts like Whoopi Goldberg. Otherwise the list of stars fades to C-grade very quickly. 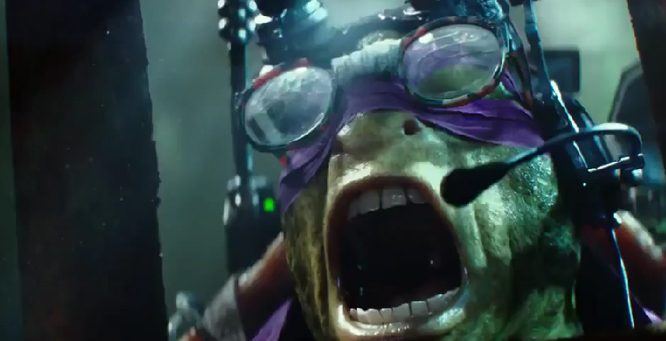 Of course if you grew up loving the adventures of the TMNTs, you’ll very likely love this film. I am left with the distinct impression that Donatello, Raphael, Michelangelo and Leonardo (Da Vinci) were much better painters than they are CGI turtles.